imperfect macarons will have to do. 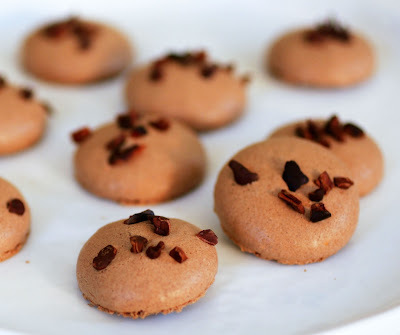 I sprinkled the tops of each with cacao nibs, which are a slightly bitter counterpoint to the sweet macarons, and add a pleasant crunch. The filling is a classic ganache, and can be tailored to your taste by your choice of the cacao percentage of your dark chocolate. Because the macarons are sweet, a high percentage chocolate is ideal here (around 70%), particularly if you want to maximize the chocolate punch. 1. 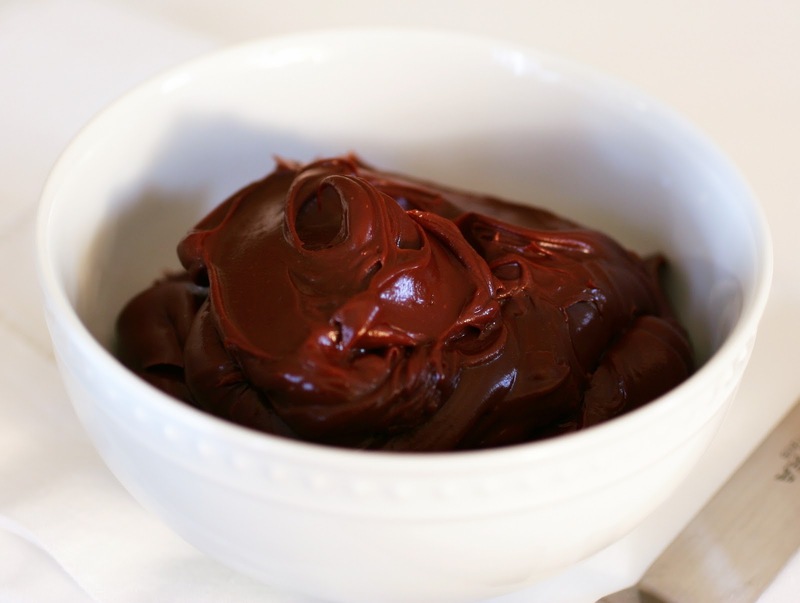 Place the chocolate in a medium bowl and set aside. 3. Line a baking sheet with a silicone mat or parchment paper. 4. In a food processor, process the cocoa powder and almond flour with the confectioners’ sugar until well blended. Sift the mixture through a medium-mesh sieve into a bowl. 5. In the bowl of an electric mixer, using the whisk attachment, beat the egg whites on high speed until foamy. Very gradually add the granulated sugar and beat until stiff and glossy. Add the vanilla and beat until blended. 6. Add half of the sifted almond mixture and fold it in with a spatula. Add the remaining almond mixture and mix it in a light circular motion. Press and spread out the batter against the side of the bowl. Scoop the batter from the bottom of the bowl and turn it upside down. Repeat this motion about 15 times. When the batter becomes nicely firm and drips slowly as you scoop it with the spatula, it is ready to be piped. 7. Position a rack in the center of the oven and preheat the oven to 300°F. Fit a pastry bag with a .4-inch plain tip (Ateco #4). Scrape the batter into the bag. Pipe out 1-inch rounds of batter onto the prepared baking sheet, spacing them ½ inch apart. Rap the baking sheet firmly against the counter a few times to remove any air bubbles. Top each macaron with a few cacao nibs. Dry the batter at room temperature, uncovered, for 15 to 20 minutes. The batter circles should not stick to your finger when you touch them. If they do, let them dry a little longer. 8. 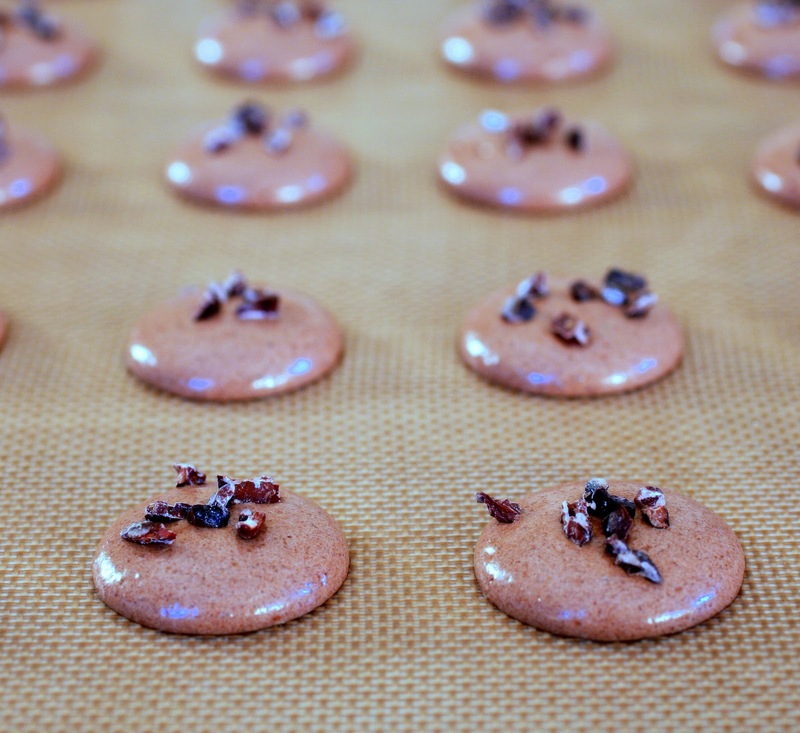 Stack the baking sheet with the macarons on it on another baking sheet. Place both sheets, stacked, in the oven and bake the macarons for about 12 minutes, until slightly crisp (they will crisp more upon cooling). Cool completely on a wire rack. 9. Scrape the ganache into a pastry bag fitted with a .4 inch plain tip (Ateco #4, the same size as you used to pipe the macarons). Pipe a grape-sized dollop of ganache onto the underside of a macaron. 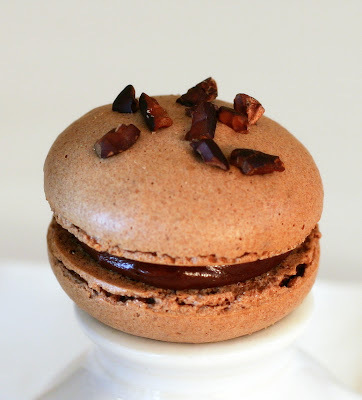 Gently press the underside of another macaron against the ganache until it spreads almost to the edge. 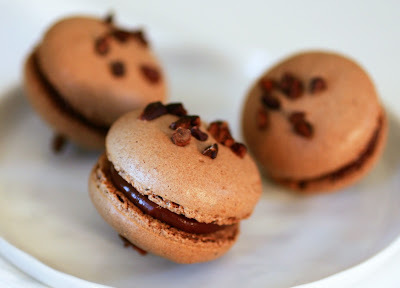 Repeat with the remaining macarons and ganache. Store the macarons in an airtight container in the refrigerator for up to a week.